Or, My 2 Device Continuum. I now use a Microsoft Surface Pro 2 instead of a Lenovo X1 Carbon, a Surface RT, and a Windows Phone (Nokia Lumia 920). I expect soon I’ll add back another Kindle device. At least for me these converged. 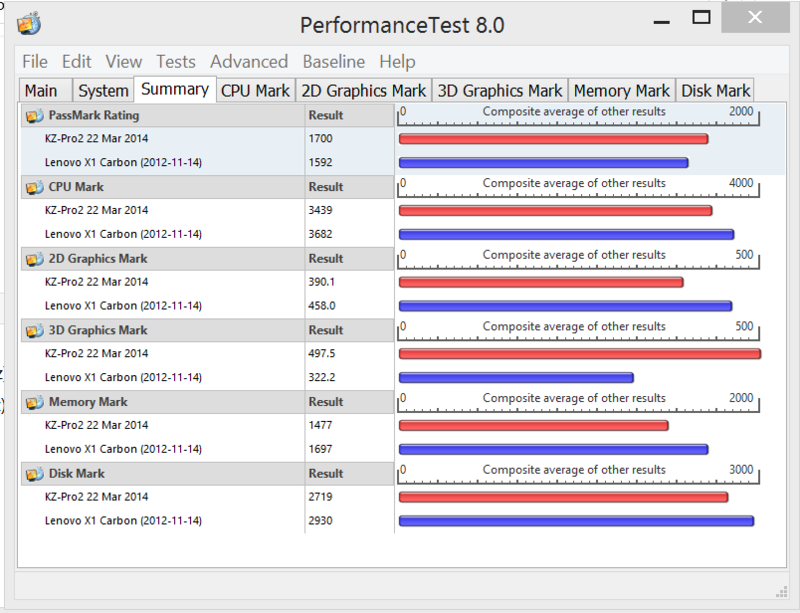 Here are the PassMark ratings for the Surface Pro 2 vs. the X1 Carbon. 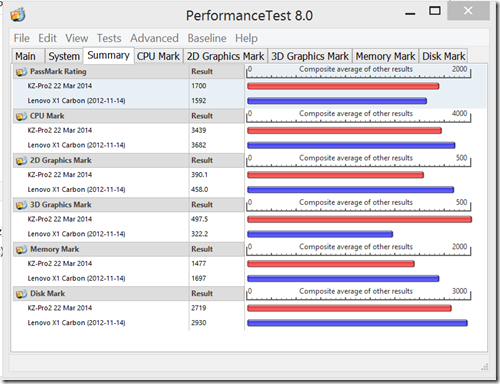 So at first glance you see that the X1 Carbon (18 months old) had better performance. And it is only slightly heavier. However, the Surface has a touch screen (there are models of the X1 Carbon that are touch) but it also has a 512 GB hard drive (solid state drive). It also seems to have better better battery life. It is nice and small for those plane trips. Small enough that the seatbacks seldom come close. The size of the Surface screen is much smaller, but thanks to the very nice Magnify feature (and an excellent set of contact lenses) that’s not a problem. And when docked, the Surface can drive my Dell U3011` monitor at 2560×1600 pixels. The Lenovo could only drive it at 1920×1080 (if I recall). The fact that Surface Pro 2 runs Windows 8.1 and not the RT (Runtime) version is a big piece of the convergence. Obviously when just running the Windows 8 RT OS these would never converge. I use far too many Windows programs for that. I’m quite amazed at how small my computer bag is now. Make it much easier for me to ride my bike to work. I’ve enjoyed my my Lenovo X1 Carbon for sure. It has been a wonderful machine. I think the one thing that impressed me the most was the battery life. And Lenovo did a nice job of not wearing out your battery. They intelligently charge your battery so that the battery life is prolonged. Some people are upset that it’s not charging 100% of the time when you plug it in, but I value what they’ve done. The stepping CPU obviously goes a long way, just don’t install Windows Hyper-V since that will force your machine (this and the Surface) to run at 100% of CPU Turbo speed KILLING your battery life. I was obviously pleased with the performance of the notebook too. The hard drive was the largest SSD drive that was available at the time. My Lenovo did seem more reliable at sleeping and resuming. I’ve too frequently had to Hard Boot my Surface device. I hope I understand what is happening soon. I liked the close it up and go convenience that the Lenovo combined with Windows 8.1 brought to my life. Configured as I would carry them, the Surface is 11 oz lighter than the X1 Carbon. The Surface with the Type Keyboard weighs in at 2 lbs 9 oz while the Lenovo weighs 2 lbs 15 oz. (let’s be fair… I always travel with the keyboard.) However, the power supply is MUCH smaller on the Surface. The supply that came with the surface weighs only 8 oz while the specially purchased thin and lightweight Lenovo adapter is 13 oz. So now we’re up to 11 oz difference between the two. Then of course the weight of the computer bag required for each is quite a bit too. Update: I do now have a new Kindle Paperwhite back. I traded in two of my old Kindle’s (A keyboard and a DX) and purchased the Paperwhite. Really enjoy it. I’ve already read 2 books. This entry was posted on Sunday, April 6th, 2014 at 5:58 pm and is filed under Technology. You can follow any responses to this entry through the RSS 2.0 feed. You can leave a response, or trackback from your own site.